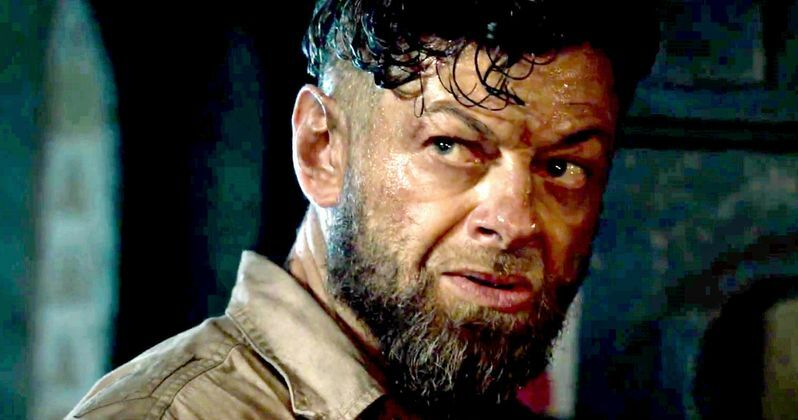 Marvel Studios unveiled the first Black Panther trailer on Friday, during ABC's Game 4 coverage of the NBA Finals, which started in a way fans weren't expecting, an interrogation between Everett K. Ross (Martin Freeman) and Ulysses Klaue (Andy Serkis). A new breakdown of the trailer by director Ryan Coogler and Marvel Studios president and producer Kevin Feige reveals new details, including what Ulysses Klaue will be replacing his missing left arm with, which could spell trouble for Black Panther. But first, director Ryan Coogler explains why he wanted to open the trailer with this interrogation scene. "One person knows quite a bit about Wakanda and another person who thinks they do, but they don't. But I thought it would be awesome to start with a character who has seen Wakanda in its true light." Fans were first introduced to Ulysses Klaue in 2015's Avengers: Age of Ultron, where he had helped the robotic villain Ultron (James Spader) get his hands on some vibranium, the indestructible metal that is among Wakanda's chief resources. During the deal, Klaue's own arm was ripped off by Ultron, and we see in the trailer that his arm is still missing. Entertainment Weekly's trailer breakdown reveals that this interrogation takes place at a safe house in Korea, with T'challa (Chadwick Boseman) and Okoye (Danai Gurira) watching the interrogation go down. While we don't get to see it in the trailer, this report reveals that Ulysses Klaue will have a new weapon in place of his hand. Here's an excerpt from EW's trailer breakdown. "In the comics, Klaue's weapon was a sonic emitter he used as a prosthetic for his missing arm. In this film, he attaches a piece of advanced Wakandan mining equipment as his arm-cannon, which is presumably what led the CIA and Black Panther to capture him. In this shot, we can see the limb has been taken from him." This report also reveals that the vibranium found in Wakanda gives them the ability to develop technological achievements that no one else can, such as the Royal Talon Fighter, which is seen flying over Wakanda's capitol city early on in the trailer. The waterfalls we see in the trailers are known as Warrior Falls, where all kings have their coronation ceremony, including T'challa, who will be crowned king of Wakanda after his father T'chaka (John Kani) was killed in Captain America: Civil War. One of the other characters introduced in the trailer is Forest Whitaker's Zuri, who Ryan Coogler said is like the Obi-Wan Kenobi of Black Panther. Here's what the director had to say about this character below. "He's somewhat a religious figure or spiritual figure. Spirituality is something that exists in Wakanda in the comics, and it's something we wanted to have elements of in the film. Forest's character, more than anything, is a major tie-back to T'Challa's father. Zuri is someone he looks to for guidance." There is also a scene in the trailer where Zuri and a group of children are participating in a sacred ritual, planting something for the new king T'challa from what is known as the Heart-Shaped Herb. Kevin Feige explains that this herb has some mystical powers, because there is vibranium laced within that soil which gives it some mystical qualities. Here's what Ryan Coogler had to say about the Heart-Shaped Herb. "The Heart-Shaped Herb is how Black Panther achieves his powers. He can fight hand-to-hand with Cap, who's a supersoldier, so he has super strength and heightened instincts that give him his enhanced abilities. The Heart-Shaped Herb is what Black Panthers over the generations would consume, once they earn the title, which gives them their physical edge." This trailer breakdown also reveals that the villainous Erik Killmonger and his team springs Klaue from the Korean safe house, to join forces, with Klaue seeking vibranium and Killmonger seeking to take control over Wakanda itself. It is also revealed that Killmonger is a Wakandan exile, who is seen in the trailer being lead into a chamber with the tribal leaders of Wakanda. In case you missed it last week, or want to watch it again, take a look at the Black Panther trailer below.